“…I want to use my whole life to develop new language for hope. Where His Light Was comes from the perspective of when you’re walking through a hard time, it feels dark, and you can’t see where you’re going, but God said go. If you keep moving forward you will reach your destination and realize you were never alone. Through the mystery and unanswered questions, He was with you the entire time. Don’t give up. 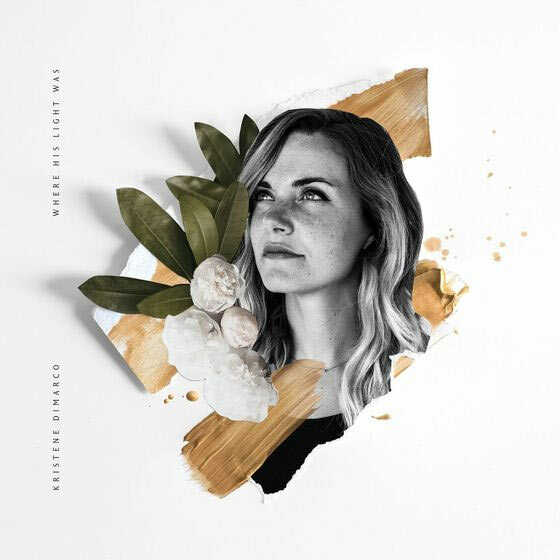 Keep going…” Kristene DiMarco, one of the newest signings to Bethel Music, is probably one of todays most underrated worship artists you may have never heard…until now that is. I mean, you can remember Kari Jobe, Kim Walker Smith, Meredith Andrews, Matt Redman, Crowder, Leeland, Chris Tomlin, All Sons And Daughters, Lincoln Brewster, Paul Baloche, Hillsong UNITED, Jesus Culture…you get the picture. Perhaps you can name 10 songs from each of these aforementioned artists at a moment’s notice. But can any of you really name a Kristene DiMarco single? Not to discount her music, but I reckon prior to the latest project Where His Light Was, I wasn’t able to either. In fact, I wasn’t going to review this album any time soon (due to apprehension of the unknown!) but a chance listen to “Take Courage” and I was hooked. 50 odd minutes later, and it’s my strong assertion that Where His Light Was is one of 2017’s best albums ever, that hopefully encourages you all to dive in and listen to this inspiring, honest and encouraging worship leader, pouring her heart out for Jesus, and drawing us all in with her eloquent words and pristine voice. Speaking of the promotional single “Take Courage”, the guitar led mid-tempo ballad, co-written with Jeremy Riddle, was also present on Bethel Music’s Starlight earlier in the year, as we are glimpsed with an earnest encouragement for us to not be afraid and to keep fighting the good fight, never giving up, as ‘…He’s in the waiting, hold onto your hope as your triumph unfolds, He’s never failing…’. As Kristene ardently recounts that we can all rest easy because Jesus is with us, and is holding our lives in the palm of His hand; this album highlight, and potential worship melody on Sunday mornings in churches everywhere hopefully in the near future, is thoroughly deserving of many listens, and rightly so. While the debut official single from the album is “I Am No Victim”, a mid tempo piano led CCM-esque ballad, where Kristene majestically highlights the fact that our mindset when living in the freedom on Jesus Christ, ought to be different than before. Instead of seeing ourselves as victims, we should, and definitely can, declare that ‘…I am who He says I am, He is who He says He is, I’m defined by all His promises, shaped by every word He says…’. Jesus’s word and His promises show us beyond a shadow of a doubt who we are, despite everything the world says, so this melody, even if we do not feel the truth now, is something we can proclaim and prophesy, until we understand the gravity of the situation that our identity is in Jesus and not in anything else. The rest of the vibrant, inspiring and poignant melodies from Kristene are sure to strike a chord with many, as we all marvel at the prowess of Kristene as a songwriter and a singer. Album opener “Doxology” is an acappella 40 second refrain of the chorus of one of my favourite hymns ever, while the title track is second, clocking in at just under 2 minutes, and is as electronic and autotuned as ever, with Kristene passionately reiterating the notion of God being with us every step of the way, even during the times when we cannot see the effects of His handiwork. The gospel and soul infused melody “Fear Not”, complete with hand claps and a swaying, groovy, laid back and chilled atmosphere, is sung from God’s perspective, and contains a stirring gospel choir as backing vocals, while we are reminded that ‘…remember all I told you, remember all I said, when the questions start arising, keep your eyes fixed straight ahead, hold on tightly to the promise, hold firmly to the truth that I love you, oh I love you…’; and “Never Ever”, a piano prominent slower paced ballad, highlights the ever true notion that there has never even been a moment that God has failed to show up in our lives- He is always moving and always present, and we just have to be looking in the right places to see it. As much as the front end of the album is engaging, the back end of Where His Light Was is even more so. The Seth Mosley penned “Jesus Is Willing”, featuring Tasha Cobbs Leonard on guest vocals, is as magical and impacting a song as any on the tracklist, as we are presented with a worship/CCM melody where both vocalists harmonise perfectly, and brilliantly convey the ever true fact that no matter what the circumstance, Jesus is with us, and He always has the best plan for us, and our best interests at heart, that He ‘…Jesus is willing, Jesus is here now, Jesus won’t fail me, He doesn’t know how…’, while the equally impressive 4 minute worship melody “Your Love Stands Alone” has Kristene channelling her inner Kim Walker-Smith vocally, pointing out to us that the love of Jesus stands taller and higher than any other love on earth, that the only thing we ever need is Jesus’ love and ‘…there is nothing, that could ever come close, Your love stands alone, from the heights to the lowest of lows…’. Kristene also delves into the genre of the modern hymn, as that exactly what “Hope Is Alive” could be in the future- it sounds like something very special and Holy Spirit anointed. An Easter themed melody that could (and also should) be a single mid-April next year, Kristene’s vibrant and explosive melody, co-written with Brian Johnson, Bill Johnson, Sean Feucht and Matt Hammitt, is definitely a song for the ages, something that could be timeless in the same vein ala Matt Redman’s “10 000 Reasons”. While the penultimate song from Kristene is the earnest, haunting and mysterious strings led 5 minute “Could You Be This Good”, where Kristene ardently poses the question of whether God can be this good, the kind of good that forgives instantly and loves unconditionally, which lyrically is very deep and provides much food for thought; and the album ender “I Just Wanna Worship” is probably my favourite song on the album. As Kristene contemplatively reflects upon the fact that all she wants to do is worship her Lord and Saviour, this is a reverent prayer that we all must strive to sign and mean in the near future- that all we want to do is worship Jesus no matter what the situation is. Well done Kristene for a flawless album and definitely a favourite of mine in 2017! What can I say about Kristene DiMarco’s first studio album in 5 years? Where The Light Was isn’t your usual worship album, as it contains plenty of musical genres within this 11 song tracklist, and that’s what makes it musically unique, fresh, reinvograting and diverse. An album that will deifnitley be on my rotation on iTunes for a long while yet, there’s nothing much more to say. Than to listen to “Take Courage”, “I Am No Victim”, “Hope Is Alive”, “Jesus Is Willing”, “Your Love Stands Alone”, “I Just Wanna Worship”, and more. Actually, I reckon you should listen to the whole album. You’ll be pleasantly surprised at how much Kristene changes your perception as to how worship music should sound like.